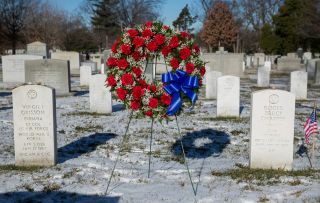 The graves of Apollo 1 astronauts Gus Grissom and Roger Chaffee after a wreath-laying ceremony that was part of NASA's Day of Remembrance on Jan. 28, 2015, at Arlington National Cemetery in Virginia. Astronaut Ed White was also killed in the tragic Apollo 1 fire. The Day of Remembrance honors the 17 NASA astronauts who died in the agency's three tragedies — the Apollo 1 fire in 1967, the loss of the space shuttle Challenger in 1986 and the destruction of the shuttle Columbia in 2003. The shutdown is now over, after a record-setting 35 days, so NASA can start planning for this year's memorial activities. Astronauts haven't launched to orbit from American soil since the space shuttle's retirement in 2011. Since then, the agency has been dependent on Russian Soyuz rockets and spacecraft to provide crew transportation to and from the ISS. SpaceX isn't the only company working to change this situation. NASA also signed a commercial crew contract with Boeing, which is developing a capsule called the CST-100 Starliner. That craft is currently scheduled to launch on its maiden uncrewed flight to the ISS in March and make its first crewed trip in August.